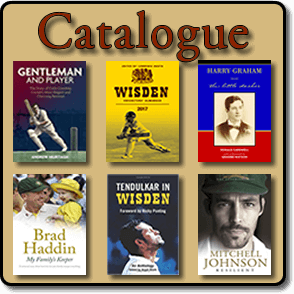 Welcome to Roger Page Cricket Books Catalogue February 2018. The catalogue is updated every two months. Our February 2018 catalogue is full of a range of carefully selected cricket books. These include the biographies and autobiographies of famous cricketer players. Our catalogue contains a large range of selected cricket books on a wide variety of subjects relating to cricket, people, cricket tours, ephemera and cricket collections. Our popular section on Forthcoming Cricket Books keeps you up to date with your cricket reading and literature. Roger’s cricket book catalogue is available online electronically via a pdf document through email and by hardcopy through the post. If you would like an electronic copy (soft copy) of Roger Page Cricket Books, please email Roger or complete the enquiry form on this website. To read a recent review of Roger Page Cricket Books can be found at the Cricket Couch and at ESPNcricinfo by Russell Jackson “The Last Cricket Bookseller”. Unless otherwise stated, all books in good condition and bound in cloth boards. Books sold cannot be returned or exchanged. G.S.T. of 10% to be added all listed prices for purchases within Australia. Please carefully read the postage and handling charges on the right sidebar. Overseas Remittances – bank drafts in Australian currency – should be made payable at the Commonwealth Bank, Greensborough, Victoria, 3088, Australia. Mastercard and VISA accepted. If the book your are looking for is not here, send me an email or fill out the inquiry form at Contact / Order Roger Page Cricket Books. To learn more about Roger himself visit the about page. Check out the Roger Page Cricket Books Facebook page. We look forward to hearing from you. If you would like an electronic copy (soft copy) of Roger Page Cricket Books, please email Roger or complete the enquiry form on this website. Enquiries for all other items are welcome. Cricket books and collections purchased.